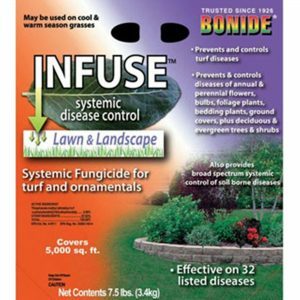 SOIL SERVICE NEWS- Japanese Beetles, Watering, Fungus Issues, Brush Control, and more! We all learned last year that the Japanese beetle is definitely here and if you don’t think you had them, you probably weren’t looking! We expect the adults to emerge any time now. 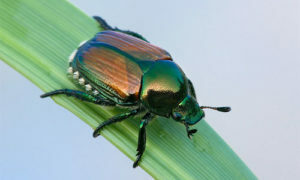 Japanese beetles are easy to identify; they’re about ½ inch long with metallic bronze wing covers and bright green bodies. Look for adults to emerge around Mid-June and possibly sooner. Large groups feed mainly in the morning on leaves and fruit. Damaged leaves lack green tissue with a papery, netted appearance. Female adults mate continuously and lay eggs in grasses for 30-45 days. This means they have an extended egg hatch in late July into August and lawn damage is seen in August and September. Adults can be controlled with many conventional products but there are no effective organic control products. Kentucky bluegrass lawns are grub magnets in general and this is just as true for Japanese beetle grubs. 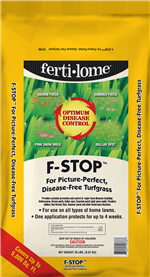 Fescue lawns can also be damaged but symptoms are more subtle than in bluegrass. 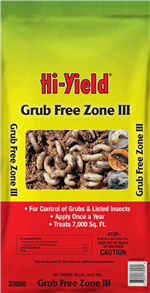 We highly recommend a preventative grub treatment with Hi Yield Grub Out applied about the 3rd week in June to control the early hatch of Japanese beetles and the more common masked chafer grub. 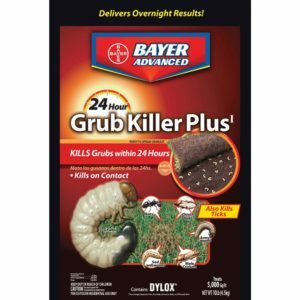 But, because they have an extended egg hatch, we should be prepared to make a rescue treatment with Bayer 24 Hour Grub Killer in August or September. We can potentially have more disease issues this year due to much warmer temperatures combined with rain, especially evening rains. Water only in the morning, preferably before 9AM. If possible, water at the base of plants instead of overhead. Soil Service Garden Center stocks Dramm watering wands that are excellent for this purpose. Here’s a new way to predict when Brown Patch fungus in fescue is active. An updated way to predict when Brown Patch (Rhizoctonia solani) becomes active is by using the “flip-flop” rule when nighttime temperatures of at least 68 d F and daytime temperatures of 86 d F or more are present for several days in a row. Kansas City’s infamous hot, muggy days with high dew points (in the 70’s) also gives us a heads up that the disease may be active. 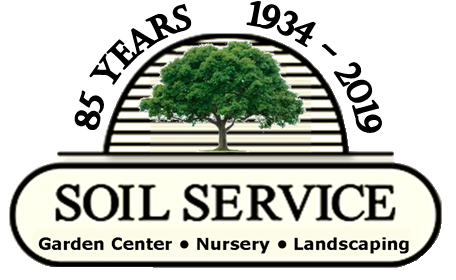 Control is difficult but your Soil Service Garden Center will do our best to help with your situation. Have you ever cut brush or vines only to see the plants come back with more shoots after cutting? You can fix this problem. We see this all the time. 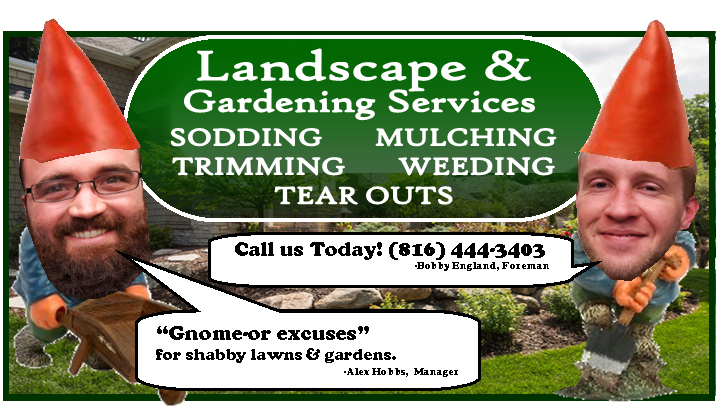 A customer comes in to get a control product for a stump, vine, or brush that was cut a week or two before seeing us. Unfortunately we have to tell them the train left the station because the plant heals the wounded area within a day of cutting. This quick healing blocks a control product from moving to roots where it kills the plant. 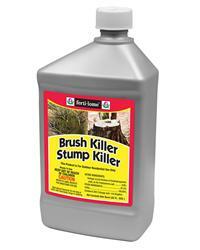 Your Soil Service Garden Center stocks Ferti-lome Stump and Brush Control to keep plants from coming back. Mix with water and Ferti-lome Spreader Sticker for foliar applications or apply undiluted, without spreader sticker, to a freshly cut vine or stump. This is the time of year to get rid of these problem plants once and for all. 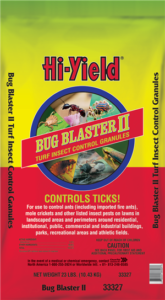 Bug Blaster II is a highly effective granular control product for lawn insects such as ticks, fleas, ants and many other nuisance pests (not grubs). Each bag treats 5000 sq. ft. and is available at the Garden Center. 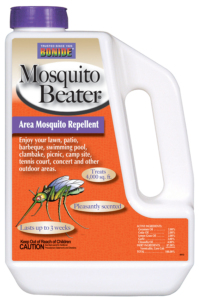 Mosquito Beater for lawn and gardens is available as an organic repellent or a traditional control product. Both come in easy-to-use hose-end bottles. Organic Mosquito Dunks are used in birdbaths, water gardens etc.